Hey gang, my latest blog post is up on the Charleston site. 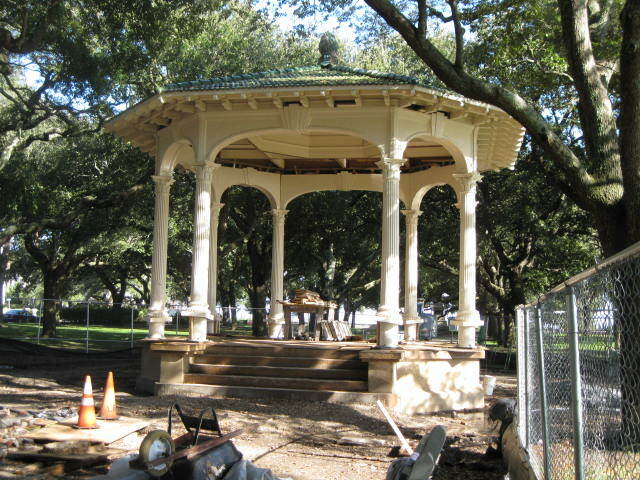 This week we highlight the renovations to the White Point Gardens gazebo, and its implications for Charleston wedding season. Check it, yo! This link is good for the next week, after which you will have to scroll down, because the blogging software is CHUNKY! 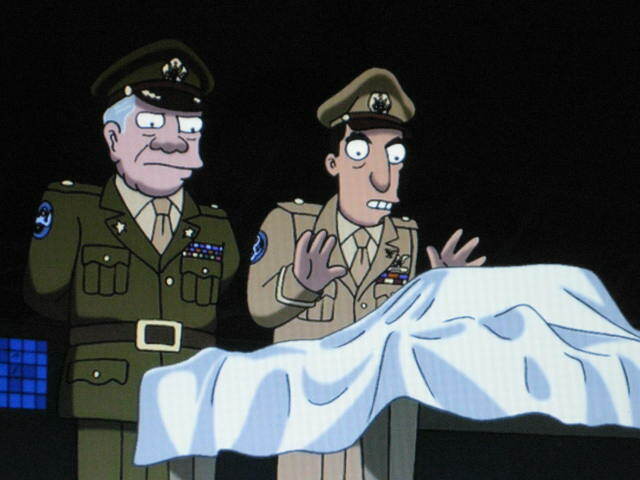 General, in all my years of covering top secret discoveries with sheets, I’ve never dramatically revealed anything as shocking as this! Dun-dun-DUNNN! As I may have whined earlier, the type of work I have been doing lately has really cut into both my time and my desire to blog. This is primarily because much of that work has been of the social media genre – blogging, article writing, posting to Digg and Reddit, tweeting, tweeting and more tweeting. And also tweeting. Additionally, a large part of what I was doing was developmental in nature. Since early October I have been writing for this pretty cool “everything Charleston” website that covers dining, shopping, history and real estate. We have been slowly stocking the thing with content – monthly articles, weekly blogs and daily tweets. Well, I guess we have reached an acceptable minimum level of content, because finally we are ready to dramatically yank away the sheet from our top secret discovery (or something.) Anyway, it’s called PremiereCharleston.com and…oh, sorry. Let’s back up. Dun-dun DUNNNN!! it’s called PremiereCharleston.com and it’s really shaping up. And since it has sapped my will to live blog, I figured I would start excerpting some of my stuff here, starting next week. Oh, and visit the site, dammit! I waited for my ship to come in ‘til I passed out on the beach. It seemed the one true love in my life was way beyond my reach. And even though I tried so hard I felt my heart might burst. I gave it everything I had but someone else got there first. Feeling a bit of the old Cincinnati nostalgia this morning (maybe because its 22 damn degrees in Charleston!) Anyway, it is definitely a small pond, but here is the best of Cincinnati pop-rock: the psychodots. Enjoy! I would love to know how other bloggers find the motivation to keep it up. Let me clarify – I don’t mean model train enthusiasts, or movie fans or music aficionados who blog about their particular passions. I mean professional writers like me who also blog. These are people who spend all day researching, brainstorming, writing and rewriting. How do they find topics to write about, let alone find the energy to do the actual writing? For the millionth-billionth time, I will tell you that I began this blog in order to drum up some Google wonderfulness in this new market of Charleston SC. I didn’t have any compelling urge to write about copywriting, nor did I think I had anything in particular to say. What I had was a need for exposure, and time. Lots of time. So, for the first two months or so I wrote every day. Every day! I can’t imagine. And as I did it, I began to like it. I began to feel the urge to write about copywriting. And I realized I did have something to say. And slowly the blogging, combined with tireless cold calling, led to more and more work. Subsequently, I had less and less time for blogging. You may say, why not blog about the various projects you work on? And I do. But again, success is the death of variety. I have been blessed to find regular gigs with the healthcare newsletter, the “everything Charleston” consumer website, and the web marketing agency in Charlotte. They chug along nicely, but I have already told you as much as I can, other than the fact that two of those three gigs also involve blogging! I don’t have the answer. But I am determined to figure it out. And I would love to hear some suggestions! Oh, and Happy New Year!